Over the past year I have had the pleasure of participating in dessert tastings from many great New York City restaurants. And one of the things that often strikes me about the best pastry chefs is their ability to not only execute great desserts night in and night out, but to also bring something new to the table–or in Mas’s Pastry Chef Catrine Oscarson’s case, something new to the farm table. One of the mandates of Mas is that the ingredients be locally sourced and seasonal. 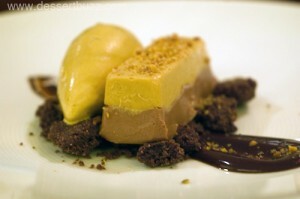 This means the desserts must be constantly rotated as the seasonal ingredients reach their peaks. The pastry chef has to have a huge repertoire of dishes at the ready in case something fresh, like a particularly good rhubarb or bunch of strawberries, ends up in the kitchen on short notice. Here’s what was on the dessert menu during the first week in August. 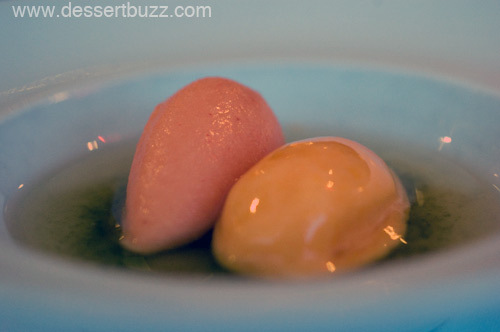 The amuse dish was a perfect example of what I was going to see from the rest of the dessert menu–very fresh, fruit-based components used in creative and innovative ways. The chilled lemon verbena soup with nectarine sorbet kicked off the tasting. This soup had very subtle flavors but you could easily make out the lemon verbena in the “broth” and the nectarine in the sorbet. It wasn’t too sweet or syrupy as these dishes can sometimes be. I would imagine this dish would be the perfect transitional, palate-cleansing plate to take the diner from savory to sweet. 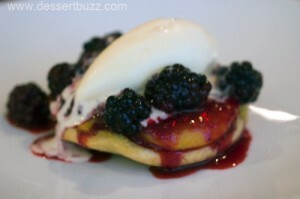 My favorite offering of the evening was the warm peach cornmeal tart with blackberry compote and sweet corn ice cream. The cornmeal tart had the moistness and consistency of a good buttermilk pancake or biscuit but with the nice added texture of the cornmeal and a great peach flavor. 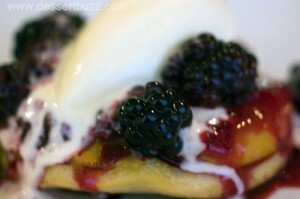 The tart was served very warm and then topped with blackberry compote, fresh blackberries and a small scoop of sweet corn ice cream. I didn’t have to try hard to taste the sweet corn flavor in the ice cream. I liked this dessert because it was without the pretension of some high-end restaurant desserts. I imagined (I have a vivid imagination) this is what they would actually serve me in a French farmhouse in Bonnieux–a great comfort dessert, like peach cobbler. No dessert list from a great NYC restaurant would be complete (in my book at least) without at least one dark chocolate-based dish. 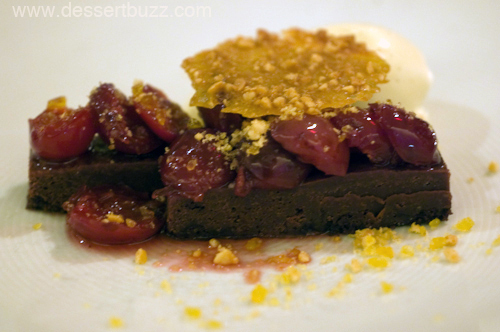 So I was pleased to see how dark they decided to go in the bittersweet chocolate tart with poached cherries and malted vanilla bean ice cream with almond brittle. 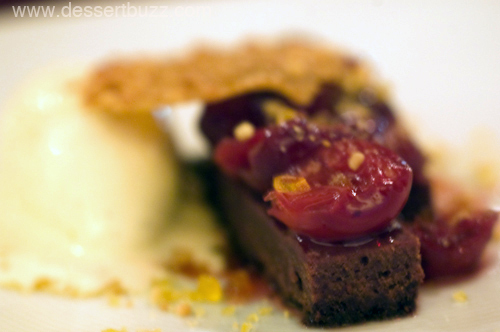 The tart was very dark and bitter and went perfectly with the sweet, plump, poached cherries and ice cream. Though it had a main component of chocolate, this dessert was not heavy and was consistent with the fruit-centric desserts I enjoyed all evening. I found the poached cherries to be really delicious. 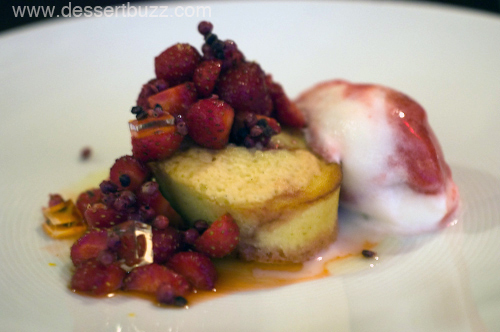 Another dish that transported me–not to Provence this time–but to a breakfast in a New England country inn–was the macerated Tri-Star strawberries with buttermilk pound cake and buttermilk sorbet. Similar to the cornmeal tart, the buttermilk pound cake was as moist as it was flavorful and there were plenty of perfectly ripe strawberries for every spoonful. 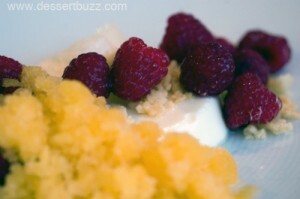 The best part of the dish was the combination of the buttermilk sorbet and elderflower gelee. The two ingredients went well together in the same way orange ice and vanilla ice cream go together in a creamsicle. The peppercorns added texture and were slightly sweet rather than spicy. The one dessert that leaned the most towards molecular gastronomy and away from the farmhouse was the (local) melon granita over white chocolate panna cotta with raspberries and lemon shortbread. In this dish the lemon shortbread is deconstructed into delicious little pebbles, again, easily discernible as lemon shortbread in flavor. The melon granita was subtle–the perfect carrier of the melon flavor and one of my favorite individual components of the evening. I could have eaten an entire bowl of just the granita. Despite all these great fruit-centric desserts made from local produce, I was told that the one dessert with no fruit was the most popular–the hazelnut-milk chocolate mousse with cocoa streusel, salted caramel ice cream and chocolate ganache. I was briefly disappointed with Mas’s clientele. To me, it seemed like going against the whole point of the restaurant. It turns out the crowd who goes to Mas is way more discriminating that I gave them credit for–the salted caramel ice cream of this dessert is super-bitter, as in a nine on a scale of one to ten! I would never guess that this flavor profile would fly with the masses! With a blogger who eats 20 desserts a week, yes, with lay people never! To me, the rest of the plate is all about balancing the bitter ice cream. The mousse is silky smooth and has a very strong hazelnut flavor on one half and a milk chocolate flavor on the other. Underneath the dessert is a bed of “cocoa streusel” which is really like a high-end brownie. The main room at Mas is very warm and cozy. I agree with the reviews that say it’s a great date restaurant. The friendly staff, (also noted in many reviews) was in full effect from the minute I was greeted until the time I left–I’d swear they were having a good time at work. My waitress, at two different times, had the tables on either side of me in stitches. Mas is located at 39 Downing Street. Their website is here. Catrine Oscarson will be representing Mas at the Food and Wine “Sweet” event in NYC on Sept 30. Go here for more details. In an early interview with Zac Young on DessertBuzz, (before he was a finalist on Top Chef), he mentions Catrine Oscarson as one of his favorite pastry chefs in NYC. Go here for Dessertbuzz coverage of the 2011 Top 10 Pastry Chefs in the US. Perhaps Catrine Oscarson will be on this list next year. What’s up,I log on to your blogs named “Dessertbuzz | Local treasures: great desserts from Mas (Farmhouse) restaurant” on a regular basis.Your humoristic style is awesome, keep up the good work! And you can look our website about love spells.